The Rev. 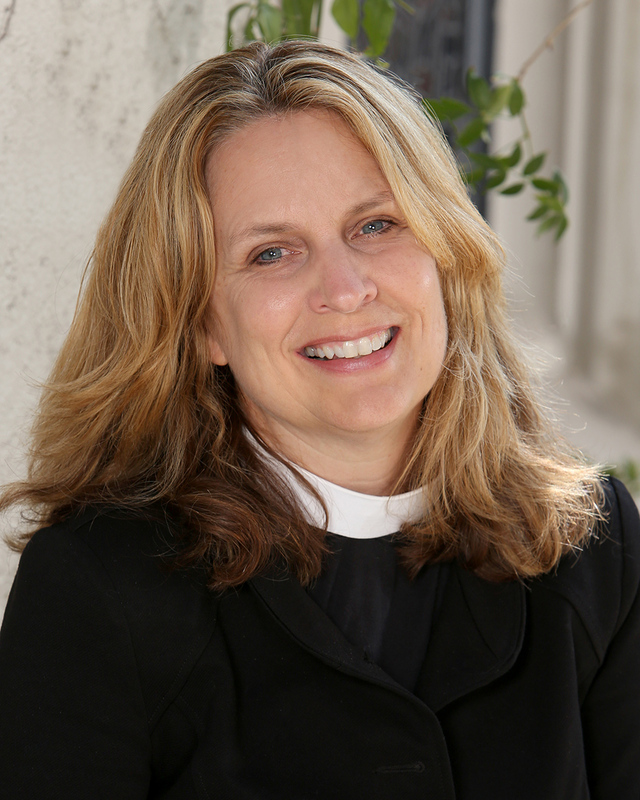 Jenifer Chatfield comes to St. Wilfrids after having most recently served as the Interim Rector and formerly the Associate for Liturgy and Formation at St. James’ in the City in Los Angeles where she also served on the Board of Trustees for the Parish’s K-6 dayschool. Before being called to ordained ministry, Jenifer had a varied career in the entertainment business in both L.A. and New York. Along with a B.A. in drama from UC Irvine and an M.F.A. from the School of Film and Television at UCLA, she has a Master of Divinity degree from Yale Divinity School, received her Diploma in Anglican Studies from Berkeley Divinity School at Yale and is a graduate of the Yale Institute of Sacred Music where she focused on Liturgical Studies and the intersection between Art and Religion. As a mother of an elementary school-aged daughter, she is dedicated to the well-being and the education of children: She continues to serve on the board of Holy Family Services, an Institution of the Diocese of Los Angeles whose mission is to offer affordable adoption services as well as facilitating foster care opportunities for children and families, and is a member of the Religious Life Committee at Campbell Hall an Episcopal Day School in North Hollywood. With a passion for formation and raising up leaders, she serves on the Diocese’s Commission on Ministry which supports the formation of deacons, laypersons and priests for leadership in the Episcopal Church. Fr. Bill is a native of Southern California and has studied music at Biola University and at the University of Southern California where he was awarded the Irene Robertson Organ Scholarship. He holds the Diploma in Theology from the Episcopal Theological School at Claremont, where he received the Community Service Award, and earned the Master of Divinity from the Claremont School of Theology. He has completed the certificate in bioethics at Loyola Marymount University and the clinical course in ethics at Harvard Medical School. For twenty-nine years he served as the Minister of Music, Organist and Associate Pastor for Newport Harbor Lutheran Church in Newport Beach and for fourteen years as Adjunct Professor of Music at Chapman University in Orange, California. He was affiliated with the Crystal Cathedral as staff member, recitalist and organist for the renowned Glory of Christmas. He is a member of the American Guild of Organists for which he has served as dean and appeared as recitalist and service organist. Fr. Bill has performed with the Pacific Symphony and Pacific Chorale, with celebrated vocalist and conductor Bobby McFerrin, with the William Hall Master Chorale, at the historic St. Paul’s Chapel in New York City, in the recital series of Washington National Cathedral in Washington, D.C., and as service organist at St. Paul’s Cathedral in London. As a hospital chaplain, he has trained in pediatrics, oncology, critical care and trauma at Mattel Children’s Hospital/UCLA Medical Center, the University of Minnesota Medical Center and the St. Joseph Health System. He is a survivor of pediatric cancer and a frequent speaker about his life and cancer heroes for medical conferences, fundraisers and St. Jude Children’s Research Hospital. Fr. Charles served as rector of St. Wilfrid's from 1978–1998. He has remained active on the Diocese of Los Angeles since his retirement, serving several congregations as interim priest and providing his unique leadership and assistance wherever our bishops have requested. Fr. Charles has returned to St. Wilfrid’s on a regular basis, assisting where needed and providing his warm smile and contagious laugh to the community and campus he worked so faithfully to build. Terry and his husband Kurt, joined St. Wilfrid’s in 2004. Terry soon became a volunteer and served as treasurer and also handled all human resource matters. In 2011 Terry was privileged to join the St. Wilfrid’s staff as parish administrator. Terry considers his position a ministerial calling and he is honored to be able to assist the clergy and staff in meeting the spiritual needs of our parishioners. Prior to working at St. Wilfrid’s, Terry was a Vice President/District Manager for Wells Fargo Bank and served as a volunteer for various non-profits. Since 1976, Deborah Pratt has taught and directed both preschool and school-age childcare. She obtained a Bachelors of Science (B.S.) in Human Development from Hope International University in Fullerton, California. She also received a Child Development Program Director and Site Supervisor permit from the State of California’s Commission on Teacher Credentialing. Ms. Pratt is delighted to make a difference in our community, and looks forward to another year of sharing God’s love with staff, children and their families at St. Wilfrid’s Episcopal Preschool, and the School and Homework Club.